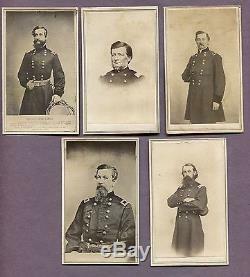 For your consideration is this very rare and guaranteed original Civil War photograph album featuring 5 Generals who served with the 1st Minnesota. When you open up the cover, the inside is dated July 22, 1864. 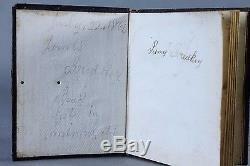 It says "James Breakey, Book Got in Minnesota". The first page is also signed James Breakey. 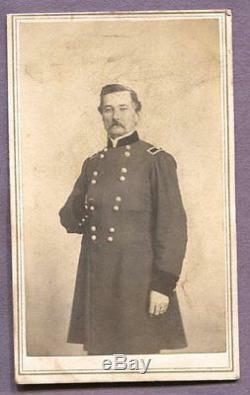 James Breakey was from Dubuque, Iowa and enlisted on 5/20/1861 as a Private. He mustered into E Company of the 1st Minnesota Infantry. He mustered out on 5/3/1864. When he enlisted, his name was written on the roster as "James Brakery". I found copies of his wife applying for a widows pension, and a few mentions of James Breakey in Dubuque history books. Each noted he served with Company E, 1st Minnesota. The 1st Minnesota lives on with enduring fame due to its extensive battle action and heavy casualties. It saw action at Bull Run, Savage Station, Antietam, Gettysburg, Bristoe Station, and Petersburg. There are some incredible websites dedicated to the First Minnesota, and they can provide hours of further research on the action the 1st Minnesota saw in the war. 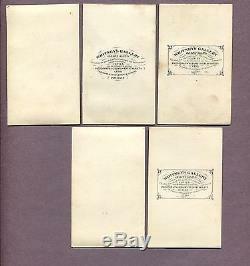 Inside the album are 11 CDV photographs and 1 tintype. This is a smaller album, and only has room for the 12 photos. The album is complete, and has since been untouched after all these years. There are 5 Generals included in the album. Willis A Gorman, taken by the photographer Joel E Whitney. 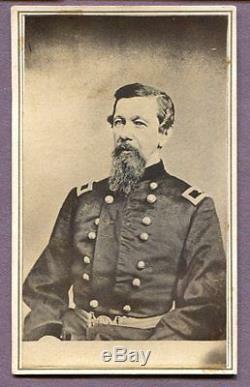 Gorman was appointed Colonel of the 1st Minnesota Infantry, serving in the First Battle of Bull Run on July 21, 1861. 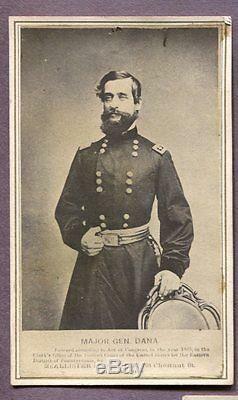 On Sept 7, 1861, he was appointed brigadier general of volunteers and assigned to command a brigade in the II Corps in Army of the Potomac during the Peninsular Campaign. His troops suffered high casualties during the Battle of Antietam. Later in the year, he was assigned to command the District of Eastern Arkansas. Stephen Miller, taken by the photographer Joel E Whitney. He enlisted with the 1st Minnesota and rose rapidly from the rank of private to colonel. There, 303 Dakota Men, convicted of participating in the Dakota War of 1862, awaited their fate. Four months later, Brigadier General Miller supervised the mass execution of 38 Dakotas who were condemned for their part in the war. This order had come directly from President Abraham Lincoln. Napoleon Jackson Tecumseh Dana, taken by McAllister & Brother out of Philadelphia and dated 1863. 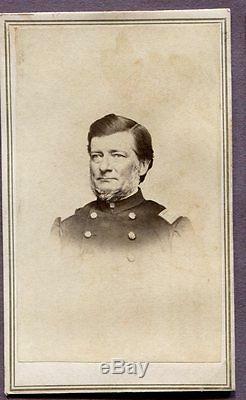 Dana entered the 1st Minnesota as a Colonel, was given brigade command in Charles P Stone's Division of the Army of the Potomac, and then in February of 1862 was appointed brigadier general. He was given command of the 2nd Division in the Union II Corps. He spent the duration of the war in administrative commands. Alfred Sully, no photographer listed. Sully was the son of a portrait painter, Thomas Sully, and Alfred himself was a painter and widely regarded as an Indian Fighter. He headed US troops out of Ft Leavenworth, Kansas in June of 1861 as captain, and occupied the city of St Joseph, Missouri declaring martial law. He was commissioned colonel of the 1st Minnesota Volunteer Infantry in February of 1862, and was promoted to brigadier general on September 26, 1862. Sully was sent to command cavalry troops at Fort Randall, DT and played a role in the Indian wars. In September of 1863, at Whitestone Hill, Dakota Territory, his troops destroyed a village of 500 tepees that lodged Yankton, Hunkpapa, and Sihasapa Lakota Warriors. This destruction was due to the Dakota Conflict of 1862 that happened a year prior. Minor T Thomas, taken by Joel E Whitney. Minor Thomas enlisted 4/29/1861 as a 2nd Lieutenant of Company B, 1st MN Infantry, and he was promoted lieutenant colonel 10/18/1861 of the 4th Minnesota. 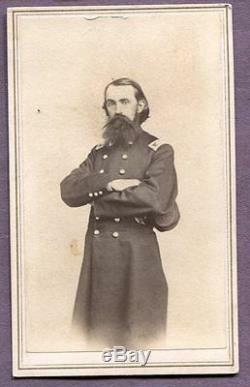 He was promoted Colonel of the 8th Minnesota on 8/24/1862, and brevetted brigadier general on 3/13/1865. Minor Thomas was wounded at the battle of Bull Run, Virginia. In 1862-63, while he was Colonel with the 8th Infantry, they were involved in a number of Indian skirmishes in the state of Minnesota, at battles near Pomme de Terre, Sauk Centre, and Paynesville. Minor Thomas joined the Sully Expedition against the Sioux in 1864, traveling the West as an Indian fighting regiment. 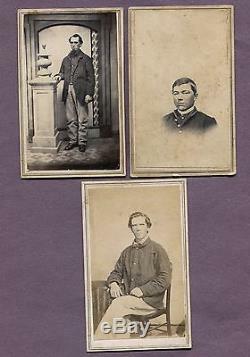 Also in the album are three original photographs of soldiers. None have identification, but I assume one is of Private James Breakey. 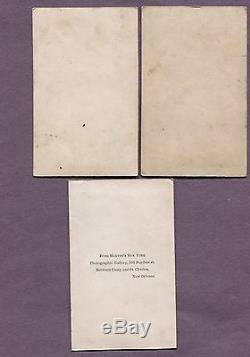 One of the photos has a stamp on the back "From Harvey's New York Photographic Gallery, 106 Poydras St, Between Camp & St Charles, New Orleans". 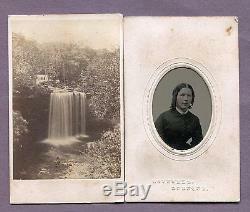 There is one nice Whitney CDV of Minnehaha Falls in Minneapolis, and 3 photographs of women. 2 are marked with Dubuque photographer stamps, and I presume they are related to Private Breakey since he was from Dubuque. The album measures 5 1/4" by 4". None are trimmed or damaged. Overall, an incredible chance to own this rare original 1st Minnesota photograph album. This would be the highlight in many collections, and is a pleasure to own a piece of history such as this. Be sure to check out my auctions for historic photographs and Americana for sale. Also, I will not lower values on a custom form as this is against federal law. Please do not ask to lower the value. The item "Rare 1st First Minnesota MN Civil War Photograph Album, 5 Generals, 3 Soldiers" is in sale since Thursday, June 30, 2016. This item is in the category "Collectibles\Photographic Images\Vintage & Antique (Pre-1940)\CDVs". 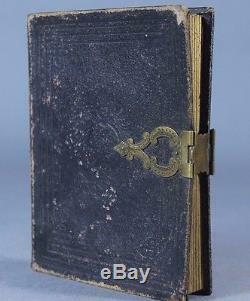 The seller is "sawyerauctions" and is located in Fargo, North Dakota. This item can be shipped worldwide.